It's 5:41 a.m. in Nampa, Idaho. My head hurts—not as much as it could, considering it's the morning after the "Boise" iteration of Punk in Drublic, the traveling craft beer and punk rock festival conceived by NOFX singer-bassist Fat Mike. Naturally, it's named for the band's 1994 magnum opus, one of the great pop-punk—nay, punk—albums, ever. For those not already savvy or possessed or even remedial detective skills, Punk in Drublic is a spoonerism for "drunk in public." From this juxtaposition of high-point brew and punk rock, you might surmise the purpose of the event. For those not already savvy, it was to get drunk—and loud—in public. It would've been so much easier to do if our car hadn't broken down an hour into the drive. After getting a ride home so we could use another vehicle, we arrived nearly five hours later than intended, and in the middle of co-headliners Bad Religion's set. That left just enough time to down some killer pork tacos and drink 24 ounces of NOFX's new Punk in Drublic hoppy lager (5.8 percent ABV), brewed in conjunction with Stone Brewing, before NOFX took the stage for an economical but highly entertaining 10-song set. During which, we purchased two more Punk in Drublics—potentially the last two sold during the fest, since it was three minutes to last call. We'd have bought more, but servers weren't allowed to sell unopened cans, or even let us take empties as souvenirs. Aaaaahhhhh—what a refreshing taste of home. You'd think that only Utah would have such a dumb regulation/restriction/rule/law. Actually, I did think that. Because it's silly. And it felt like the tentacles of the clueless, frightened, myopic, moralizing Utah legislature stretched hundreds of miles beyond our border to slide up into my business. It's not about wanting to drink more beer. The Punk in Drublic box and can art is done in popping fluorescent pink and green colors, just like the cover of Punk in Drublic. 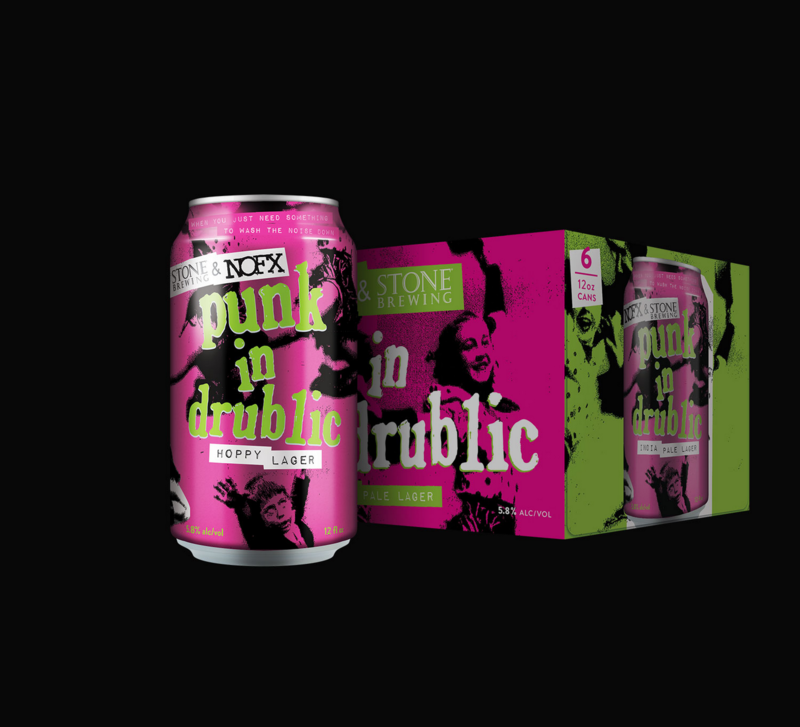 The design is so good, and the idea of NOFX-branded beer is so good, that it has value as art, a keepsake and a conversation piece. It's also emblazoned with all the tour dates, making it a limited-edition, ostensibly tour-only treasure. To dangle such a thing of beauty in front of NOFX fans and not allow them to take it home is cruel. Even back here in SLC, a bar will let you take home an empty can, provided they wash it out first. I have no idea if that's legal or just a loophole, but that has been my experience with Iron Maiden's Trooper beer when I encountered it in local public houses. It's nowhere near as good as having a full can, with heft of content, on display—but it's something. I can see the logic behind not selling more beer to a festival of drunks who may or may not have designated drivers. But that presumes we're children who won't be able to resist ripping open our souvenir sixers on the way home. Or that we can't or won't pick up more beer at 7-Eleven en route. "One for the road" doesn't necessarily mean drinking and driving. It might just signify a desire to take home a tangible object as a sidecar to memories. So I brow-beat a concessions worked into giving me an empty box. Then, under cover of darkness, while the stands were shutting down and fans filtered out of the venue, I grabbed a few cans from the trash and shoved 'em down my pants. It wasn't my proudest moment, but I was proud. Being somewhat germophobic, however, I wonder—in Adderall 'n' coffee morning-after clarity—if I might have contracted some sort of SBD (stale beer disease), and if it was worth it. Looking at this pretty box and almost enough empties to fill it, I'd say so. But it'd be better if they were full. Maybe the rules will be different on the remaining Punk in Drublic dates in Arizona and California. Oct. 14 - Concord, Calif.
Oct. 15 - Sacramento, Calif.
Oct. 21 - Phoenix, Ariz.
Oct. 28 - Huntington Beach, Calif.